So my husband heard about my offer to let people guest-post during the month of August. He cried like a baby was a little disappointed because I hadn't formally extended the offer to him. I told him that he was more than welcome to guest-post on my blog. After all, the man has put up with me and my craziness lived in peace with me for over 12 years! (And married me after knowing me for two WHOLE years.) Like. I think the man was just ASKING for it. He married ME! The LEAST I could do was let him write a post for my measly blog. When I married Amy, she seemed to be a reasonable person. She didn't have a particular affinity for any type of paper. Maybe she liked getting money, but she wasn't crazy about it or anything. Then, we had a child, and she started staying home after we had that child, and we became poor, and my wife met...THE COUPON. It wouldn't matter now if I made $10,000/year, $100,000/year, or $1,000,000/year. I am firmly convinced that my wife would still coupon. Because she lives and breathes couponing. She is not normal in her love of the coupon. She keeps them in a binder and carries them with her EVERYWHERE SHE GOES. EVERYWHERE. Everywhere. The store? She's got her coupons. The park? Coupons. The bathroom. Yes. I've even seen them in there. I no longer question her logic when it comes to coupons. I know better. For all I know there's a secret shower sale that she's attending. Who knows. I've seen too many things to not think anything is possible with a coupon. I also will never, ever, so long as we both shall live step foot into a store with my wife ever again. I really think that should be in the wedding vows. Far too many unsuspecting husbands are roped into shopping. It's just not right. There is no "just" when it comes to women and shopping; especially when they're using coupons. Listen to me carefully, men: DON'T EVER LISTEN TO A WOMAN WHO HAS COUPONS IN HER HANDS. SHE IS NOT THINKING LOGICALLY. SHE WILL ROPE YOU INTO DOING SOMETHING THAT YOU WILL REGRET FOR THE REST OF YOUR LIFE!!!! If you choose not to trust me on this, I cannot be responsible for any harm that may come to you or your family either now or in the future. I'm fairly certain even my wife would back me up on this. What? What's that you say? You think I'm being a little over-dramatic? I'd have thought so myself, too. Until that one fateful day 10 years ago. I'll never forget the words my wife said to me. Ever. She asked if I'd go shopping with her and the baby. And here's where it got bad. She said, and I quote "We're just picking up some free toilet paper." Men, I'm going to teach you a very important lesson here. You must carefully analyze every word that comes out of a woman's mouth; especially if a coupon binder is slung over her shoulder. DO NOT TRUST THE COUPON-WIELDING WOMAN!!! What I didn't catch was that my wife said we were just picking up "some" toilet paper. At the time, I didn't understand that "some" in my book was not anywhere close to "some" in my wife's book. When they start couponing, they learn an entirely different language. It's very deceptive because we think we know what they're saying, but the meaning is very different. They do that on purpose. To trap us. When they add the term "free", the meaning is even more distorted. Don't believe me? I wouldn't have believed it myself until I experienced it. However, I can assure you that two carts and approximately 1,284 rolls of toilet paper later, I had learned. I cannot describe to you the level of humiliation I experienced as the cashier checked us out. The cashier was actually laughing at us as we purchased the toilet paper. My wife didn't help any when she told him we'd all acquired dysentery from being overseas. And that it was catching. And did he want coupons for free toilet paper? My wife thinks she's funny like that. Except she was the only one laughing. I swore that day I'd never go shopping with her again. I once heard a woman say that God has women forget how horrible labor is so they'll get pregnant again. The cruelty is that they remember after the baby is in their belly but before they're so drugged they don't feel anything. They go through several months knowing what agony will temporarily befall them. I never understood that. Until 2 months ago. When my wife asked me if I'd run into Meijer with her "real quick". (That's another very dangerous term when a woman has coupons.) I asked her what she needed to get. "Just some free cereal." I had this sense of dejavu. Like some sort of tragedy should have been in my memory but I just couldn't grasp what it was. We had time. Sure. I'll go. I remembered why I'd had that dejavu as we were filling the 2nd cart with free cereal. I'm sure it's like the moment where a pregnant woman has her first pangs of morning sickness and suddenly remembers all of pregnancy...labor and all. Sure, she'll think about when she gets to hold her baby later, but she has to wait for that moment. And oh the pain she must endure to have that blessed moment. In the same way, I could envision the bliss of eating my free Frosted Mini Wheats and Golden Grahams, but I could also remember the laughing cashier and my wife's sore attempt at humor. I was suddenly petrified. I felt my chest start to tighten. My throat was closing up. 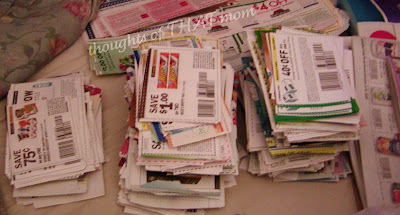 I was sure I was going to die a long, slow death of couponing. My wife says I was having a panic attack. You would think that at that moment my wife's overwhelming love for me would cause her to release me and let me go out to the car and sleep in bliss. But no. She needed me to push the second cart. It was filled, and I was committed. For better or for worse; mainly worse. Thanks to the bliss of technology, there was no cashier to jeer at me this time. They have "u-scans" now. They're basically machines where you do all the work that an employee would have done before while the company laughs at you for thinking this is a good idea. I was never more grateful for advancement. Remember my words, men. NEVER TRUST A WOMAN WITH A COUPON. You can marry her, have children with her, but do not listen to a thing she says while she is holding a coupon. Especially if she asks you to go shopping. I must intervene in Amy's defense. You chose the career of Radio. Radio is a fun career but it is also famous for not that great of a pay check. Christian Radio is even more in the lots of fun low pay category. I as a 30+ year radio veteran have come to respect the coupon clipping mom. My My Wife Lisa and I, on the other hand do dock sales and food CO-OPs. Once a month I drive to a National meat distributor in Owasso, OK and but hamburger at $1.45 a pound by the case. Hamburger patties $15.00 for 30 quarter pound patties. I also buy cases osBeef Medallions, Boneless Skinless, Chicken Breasts....the list goes on. Every Wed morning when the grocery store sales start I hit all the stores with good sales that week. Thanks for your support. It means the world to me. You truly understand the radio life. Wasn't it especialy funny when he mentioned making $1million a year...in radio? HA! Amy, looking forward to meeting you at Meijer sometime so you can "show me the ropes" of couponing. I have to support Amy here, and it's not because I am also a woman who enjoys using coupons. There's a certain endorphin rush that accompanies getting a great deal with a coupon. I love looking at my Meijer receipt and seeing that I saved more than I spent. I love filling the cart without emptying my checkbook. We're only a family of three and we have a full pantry that could sustain us for at least a week in an emergency. They are doubling coupons this week at K-Mart. I got "some" free Reeses Peanut Butter Cups, nearly free cereal, very cheap Chinette...I'm not recalling the rest. This is just too funny! My husband would never go with me. He often comments that I am going to go to jail for stealing! hahahahhaah i cant stop laughing! ive gotta read this to my husband!